Mrs McMorris' Chocolate Pie The yolks of 2 egg 3 tablespoon cornstarch 4 " of chocolate 6 " " sugar Mix all together and stir into a pint of boiling water Cook this until it becomes like custard Make crust first & bake Then add Meringue made of whites of egg and pulverized sugar. 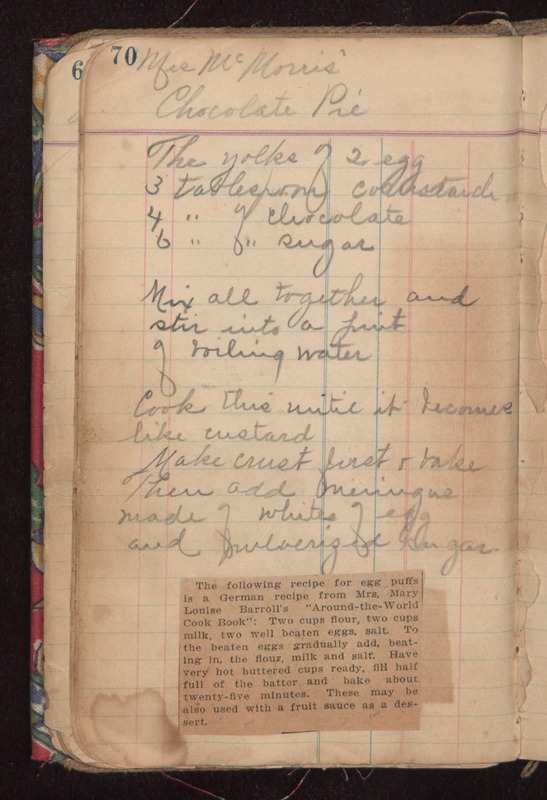 The following recipe for egg puffs is a German recipe from Mrs. Mary Louise Barroll's "Around-the-World Cook Book": Two cups flour, two cups milk, two well beaten eggs, salt. To the beaten eggs gradually add, beating in, the flour, milk and salt. Have very hot buttered cups ready, fill half full of the batter and bake about twenty-five minutes. These may be. also used with a fruit sauce as a dessert.